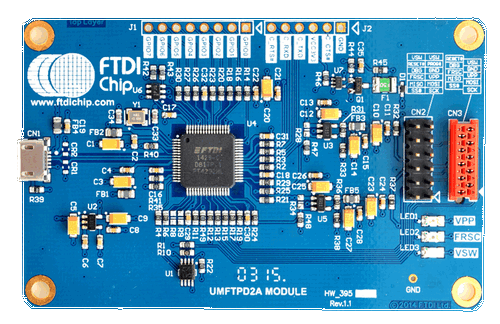 The UMFPD2A debugger/programmer module provides a USB bridge between the FT90x Eclipse IDE development tools runnng on a PC and the FT900 1-wire debug pin. This module can be used to program, configure the EFUSE and debug firmware running on the FT90x series. The UMFTPD2A module features a single line half-duplex UART signal with no handshake (One-Wire interface), one MPSSE interface, one UART interface and a Bit-Bang port. The module has configured the FT4232HL Channel A as a UMFTPD2A one-wire interface for MM900EVxA evaluation board firmware / application download, or GDB debugging. The FT4232HL Channel B is configured as a UMFTPD2A MPSSE interface with 4 GPIO control signals. This allows the UMFTPD2A to implement MM900EVxA evaluation board EFUSE program, or firmware / application upload as well. The FT4232HL Channel C is optional. It is configured as a UART that can capture the messages from MM900EVxA evaluation board insoftware debugging. The FT4232HL Channel D is reserved as a Big-Bang interface for generic GPIO purposes. The FT90x program utility can activate the required channels corresponding to the operations.